Discovering the right product is a vital part of a product development process. To do that effectively best product teams use a Product Discovery process. This process foresees you having a Discovery Backlog with a list of ideas, concepts, and hypothesis in need of validation. But how to decide what ideas to validate first? In your Product Discovery process when you have ideas gathered and quickly assessed it's time to plan the research, validation of ideas. 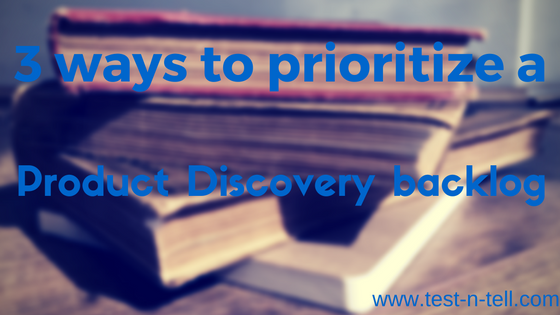 To plan the research effectively you need to prioritize ideas in the Discovery Backlog. Such ideas should be validated first. You might want to start validating the most impactful ideas first. An impact could be negative or positive. An idea could impact any possible aspects of your product. So how to estimate an impact? Start from the most important KPIs. What are those for you? Revenue, engagement, acquisition, satisfaction...? When you know what KPIs might be affected think about % of customers/users that could be affected. Is it 10%? 20%, 65%, 80%? Knowing what KPI could be affected for what % of your customers would help you prioritize the Discovery Backlog by the most potentially impactful ideas. This prioritization technique is probably the most straightforward. The riskiest ideas should be validated first. What is a risk? In this case, you might think about risk as the unknown. The ideas you know the least about are the riskiest. You can combine this technique with the previous one. The riskiest ideas that potentially the most impactful should totally be on top of your Discovery Backlog. Every research is an investment. Figuring out the way to prioritize your Discovery Backlog keep in mind the research ROI. Reconsider the worth of a research if you can immediately see that certain idea validation effort is much higher than the potential value this idea could deliver. To successfully build valuable products you need a prioritized Discovery Backlog. It should consist of ideas, concepts, and hypothesis for further validation. Discovery backlog could be prioritized by most valuable, impactful or riskiest ideas first. Valuable ideas would contribute to your revenue or would help to save money. Impactful ideas would affect both financial and non-financial KPIs in a positive or a negative way. Riskiest ideas are the ones you know the least about. Combining those parameters would help you to come up with a prioritized list of ideas to validate. Constantly validating your ideas is a major step to have a product customers would love.